The seventh annual Allegheny College Prize for Civility in Public Life was awarded to Texas Congressmen Will Hurd (R) and Beto O’Rourke (D) for their “bipartisan road trip” last year, when the two congressmen from opposing parties live-streamed collegial discussions on the divisive issues of the day over a 1,600-mile drive from Texas to the Capitol. Allegheny College President James H. Mullen, Jr. and Governor Tom Ridge, the first U.S. Secretary of Homeland Security and a 2012 Allegheny College honorary degree recipient, awarded the 2018 Prize at an event on July 17, 2018 in Washington. What happens when two Texas congressmen from opposing parties live-stream a 1,600-mile roadtrip from Texas to the Capitol? The congressmen’s road trip — amplified through Facebook and Periscope — received national attention. Immigration, healthcare and hamburgers were among the topics discussed by Rep. Hurd and Rep. O’Rourke during the more-than-24-hour trip to the nation’s capital that they took after winter weather canceled their flights. Sen. Ted Cruz and Beto O’Rourke discussed civility during election season during their final debate. July 17, 2018 (Washington, DC) – Allegheny College President James H. Mullen, Jr. presented the 2018 Allegheny College Prize for Civility in Public Life to Texas Congressmen Will Hurd (R) and Beto O’Rourke (D) for their “bipartisan road trip” last year, when the two congressmen from opposing parties live-streamed collegial discussions on the divisive issues of the day over a 1,600-mile drive from Texas to the Capitol. Allegheny College created its national Prize for Civility in Public Life in 2011 to recognize two public figures, one from the left and one from the right, who argue passionately but with civility for their beliefs. Previous winners of the national award include: the remarkable friendship of U.S. Supreme Court Justices Ruth Bader Ginsburg and the late Antonin Scalia in 2017; then-Vice President Joe Biden and Sen. John McCain, R-Arizona, who were recognized in 2016 for the powerful moments of civility they displayed during a modern presidential campaign; and the “Women of the U.S. Senate,” who were honored in 2014 for banding together to help end a government shutdown and creating a more civil climate in Washington, D.C.
To learn more about the Prize for Civility in Public Life, visit Allegheny College’s website. One of the nation’s oldest liberal arts colleges, Allegheny College celebrated its bicentennial in 2015. A selective residential college in Meadville, Pennsylvania, Allegheny is one of 40 colleges featured in Loren Pope’s “Colleges That Change Lives.” Allegheny College is known nationally as a place where students with unusual combinations of interests, skills and talents excel. In its 2018 rankings, U.S. News & World Report recognized Allegheny among the top six Most Innovative national liberal arts colleges in the country. 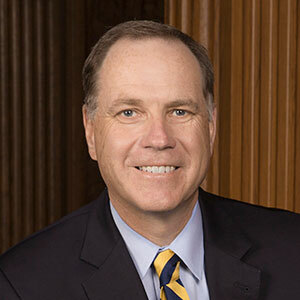 July 17, 2018 (Washington, DC) – Today Allegheny College President James H. Mullen, Jr. will present the 2018 Allegheny College Prize for Civility in Public Life to Texas Congressmen Will Hurd (R) and Beto O’Rourke (D) for their “bipartisan road trip” last year, when the two congressmen from opposing parties live-streamed collegial discussions on the divisive issues of the day over a 1,600-mile drive from Texas to the Capitol. The ceremony will take place at the National Press Club in Washington, D.C., at 11 a.m. today, July 17 and both congressmen will offer remarks during the presentation. Your coverage is welcome. If you’re interested in attending, please contact khayn@a-g.com or steve@SRACommunications.com. The event will also be live-streamed here.